A native of Lago Vista, Texas, Haines was born into a football family, as his father played in the NFL for the Minnesota Vikings and Indianapolis Colts. Haines starred in high school with his versatility, playing safety, center, wide receiver, and kicker. As a senior, he was named 1st-team All-District as a safety, wide receiver, and kicker and was named “Special Teams Player of the Year.” He committed to the University of Texas to play his college ball. 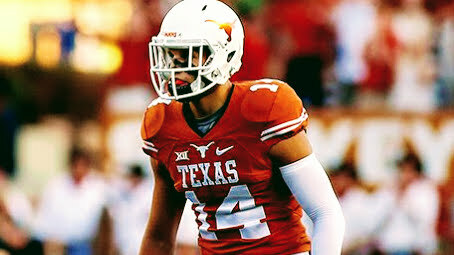 Haines had a very solid career as a Longhorn. He was a five-year safety who played in 35 games with 33 starts during his career, finishing with 175 tackles (120 solo) along with 13 interceptions, 12 pass breakups, 2 fumble recoveries and 1 forced fumble. Haines finished second in school history with 238 career interception return yards and tied for fifth with 13 interceptions. He was awarded a 2014 All-Big 12 selection, a 2016 nominee for the Burlsworth Trophy and Lott IMPACT Trophy, 2014 Academic All-Big 12 choice, and a six-time member of the Big 12 Commissioner’s Honor Roll. Undrafted in 2017, Haines has received significant NFL interest, earning minicamp tryouts with the New York Jets and Houston Texans. In 2018, the 6’1″ 194 lbs safety will return to his old stomping grounds of Austin, Texas to participate in The Spring League.